Included with the Zmodo PKD-DK4216-500GB security surveillance DVR system are four (4) weatherproof color cameras with night vision. Each camera uses a ¼ inch CMOS sensor and a 6 millimeter lens to provide full-motion color video. At night, the cameras switch to night vision mode and record full-motion video in black and white. The night vision uses 11 infrared LEDs to capture video up to 30 feet away in zero to low light conditions. Expect less than 30 feet in complete darkness and 30 feet or more in low level lighting conditions. Night vision mode can be confirmed at night by simply looking for the IR LEDs to be glowing a dim blue color. The cameras can be either mounted on the ceiling or the wall. While these cameras can capture full motion, color video; they are not high resolution cameras. These cameras are standard resolution of 420 TVL (TV lines). Also, each camera lacks a microphone and a power/active indicator light. These are basic cameras that will work well for the average installation. Other cameras can be used if desired including PTZ cameras (pan, tilt, zoom). If the other camera does not have a BNC type video connector, a BNC to RCA adapter cable can be used to complete the connection. The cameras have two connectors on board – 1 BNC type for video, 1 RCA type for power. 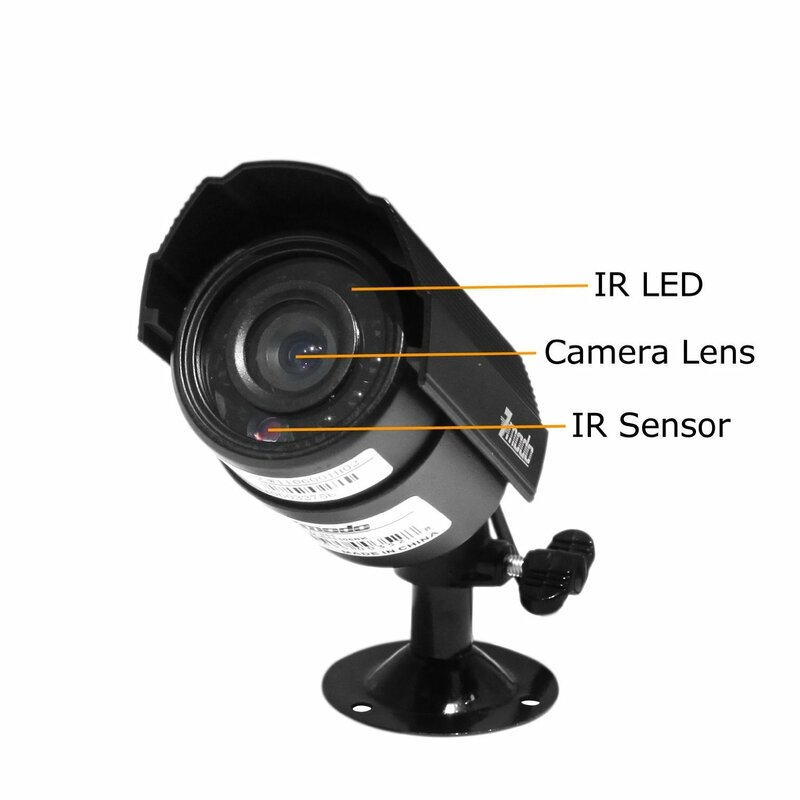 The cameras connect to the DVR through a 60 foot surveillance + power all-in-one cable that supplies power to the camera and brings video back to the DVR. Longer cables can be purchased but will require a separate power supply for each camera that has been extended. In case you are unfamiliar with a BNC type connector, they are similar to the RCA type connectors. They both have a prong in the middle with a ring at the outside of the connector. RCA type connectors simply push on to make a connection. The BNC type connector pushes on but then the outer ring is turned to lock the connector in place. The BNC type connector is much more reliable and less likely to become disconnected. Finally, the included cameras are weatherproof for outside use. Weatherproof cameras should have some protection from the elements where they do not get completely drenched during a rain shower. Weatherproof cameras are designed to withstand the normal splashing and blowing of rain and snow but not meant to get completely soaked or submerged. The operating temperature range is from 14° F to 122° F. The camera may not operate reliably outside this temperature range. At the heart of the Zmodo PKD-DK4216-500GB security surveillance DVR system is the ZMD-DD-SBN4, a 4 channel, real time, hardware-based DVR. This DVR uses H.264 video compression to compact video files for easy playback on multiple devices and to save hard drive space. This kit comes with a 500 GB hard drive pre-installed and can be easily upgraded to any SATA hard drive of up 2 TB in size. The DVR can record in either NTSC CIF (North America TV Standard) at a resolution of 352 x 240 or in PAL CIF (mostly outside North America) at a resolution of 352 x 288. CIF is a recording format standard which is supported by all surveillance DVRs. It is difficult to predict the number of days or hours the DVR can record. Although the DVR uses CIF format for recording, there are 5 selectable record quality levels (or bit rates): best, high, mid, low, and user-defined. Furthermore, if the DVR is set to record continuously, the hard drive will fill up faster than if the DVR is set to motion detect recording. Once the hard drive is full, older files will be overwritten. But in general, recording from all four cameras, 24/7, will give you about 30 days of recording before files are overwritten. Any important files can be archived onto a portable storage device via the USB 2.0 port on the back. Files can be sent to a flash drive, portable hard drive, or portable CD/DVD burner. Once files have been archived, they can be erased or just left in place to be overwritten when space is needed. 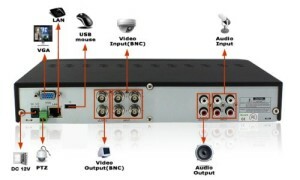 The ZMD-DD-SBN4 DVR has 4 BNC type video and audio RCA inputs on the back to support up to four cameras and separate microphones as well as the PTZ controller connector. Also, there is a USB port for attaching the including mouse used in the setup and operation of the DVR. Of course there is a power input jack. To watch video and to setup the DVR, a TV or monitor will need to be attached. The DVR has outputs for VGA and composite video. For composite video, a BNC to RCA adapter will be needed to connect to the BNC video output. If a computer monitor is not available, a VGA to composite video will need to be used to make the conversion. There is also one audio output in a RCA connector. Audio is only recorded and played in mono. As mentioned above, there is a second USB 2.0 port for making backups of video files on the DVR. USB 2.0 backup devices supported include: flash drive, portable hard drive, and portable CD/DVD burner. To connect to the Internet, the DVR has a standard RJ45 Ethernet connector too which can connect to both 10M and 100M networks. The DVR cannot connect to 1000baseT networks. But most routers that support 1000baseT can fall back to 100baseTX when needed. Wireless networking is not supported since it is not a good candidate for transmitting full motion video. Now, let’s review the many attributes that make the Zmodo PKD-DK4216-500GB such a feature-rich security system. Of course, being able to record full motion video is at the top of the list of important features. The Zmodo PKD-DK4216 has two recording modes: manual and scheduled. Manual is self-explanatory. You simply select a camera and press record while viewing the monitor. Scheduled recording mode takes a little more explanation to fully understand all that is available. The first type of scheduled recording is common. In this mode, you set a schedule for when each camera will start and stop. Continuous recording can be setup here as well. The next type of scheduled recording is motion detection. This type of recording also requires the detection sensitivity and motion zone to be set. In this step, the monitored area is mapped out so that only the desired portion of the area is watched for motion. The DVR can also be set to send an email message with a snapshot informing the owner that motion has been detected. Another type of scheduled recording is the alarm triggered recording. The DVR has an input on the back for an alarm triggered signal from an alarm system. When the alarm is triggered, the DVR will start to record the specific channel set to record for that alarm signal. The DVR can also control PTZ cameras when an alarm is triggered. For example, if a door alarm is set off, the DVR can move a PTZ camera to look at the door. As already stated, the Zmodo PKD-DK4216-500GB can support PTZ cameras. The PTZ functions can be controlled in preview mode or by a set program used during scheduled or alarm recordings. The DVR has full control over all PTZ cameras such as panning left or right, tilt up or down, and zoom in or zoom out. The PTZ camera can be set to travel a certain route while scanning an area or to travel a set of preset locations. When in preview or in playback mode, the screen can show all 4 cameras at once or one at a time. Through the OSD (on screen display), the channel (camera) number, date, and time can be displayed for each camera being shown. Also, different icons will be shown depicting certain functions going on such as common recording, motion triggered recording, manual recording, etc. The camera preview mode can be viewed on both a TV (connected through the BNC video output) and the VGA output. However, when using the graphical user interface, only one or the other display can be used. TV or VGA is selectable though a button on the front of the DVR. As with most DVR surveillance systems, the Zmodo PKD-DK4216-500GB can used to search previously recorded material. The user can input the date and time plus the channel number (camera) to search for a particular incidence. Video can be scanned in normal speed, slow motion, fast forward, and fast rewind. Slow motion forward can be viewed in ¼x or ½x speed. Fast forward and fast rewind will work in either 8x or 16x speeds. Last, the video files can be backed up to an external storage device for archiving. When backup mode is entered on the DVR, the system will scan for any available backup devices attached to the system. Backup devices can be a USB flash drive, USB portable external hard drive, or a USB CD/DVD burner. While video is recorded in H.264 format, it can be backed up to external storage in other formats. Those formats include H.264, raw, mp4, and avi. When mp4 is chosen as the backup format, a plugin is also stored along with the video files. Once installed, this plugin will allow Windows Media Player to play the mp4 files. The Zmodo PKD-DK4216-500GB doesn’t need to be connected to the Internet in order to be a fully functioning security DVR. 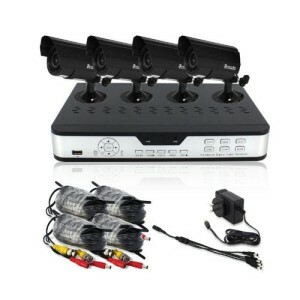 However, when connected to the Internet, the DVR can be setup to allow remote viewing of the 4 cameras. In order to connect to the Internet, a wired connection is needed to a local area network. WiFi and 3G/4G are not supported as a means of connecting to the Internet. The DVR is connected to the local network in your home or business through the RJ45 port on the back. This network port can be attached to a 10M or 100M network. 1000M gigebit networking is not supported. Most routers and switches which have 1000baseT networking ports will fall back to 100baseTX when connected to a lower speed networking device. Once wired to a local network, the DVR must be setup to connect. This is a fairly straight forward process that is explained in the Zmodo user’s manual. Once the DVR has connected to the network, the router must be configured to allow communication between the DVR and the outside world. Once again, this is explained in the Zmodo user’s manual. Once everything is connected and configured, the DVR camera feeds can be monitored from the Internet from any Internet-connected PC running Microsoft Internet Explored. Internet Explorer must be used because of the activeX controls that Microsoft supports. Other Internet browsers do not support activeX. The DVR video can also be viewed over 3G cell phone networks by a smartphone or tablet including Blackberry, Android, iPhone and iPad. The Zmodo Pkd-DK4216-500GB Security Surveillance DVR system has been around for several years and is a tried and true system. Of the customers who took the time to write a review of this kit, over 80% gave it a 4- or 5-star rating. The most common comment is that the system is very easy to install, setup, and use. The majority of people are happy with the system and realize it is a basic entry level system. But for being basic, there are many features that aren’t found on some more expensive models. As with most security DVR systems, image quality is often a common complaint. This is a standard definition camera and details from a distance just aren’t going to be as clear. The 11 IR LED night vision works in the dark but not quite as far as some would like. But these are basic cameras that will suit most situations the average customer will encounter. Personally I found the user manual very poorly written and only usable as a general reference. The system isn’t complicated and with a little trial and error, it is very simple to setup and use. Anyway, who reads instructions, right? 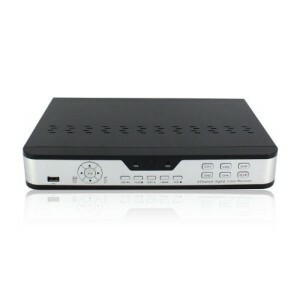 T he Znodo PKD-DK4216-500GB Security Surveillance DVR System retails for about $250. Buying this kit from an online retailer can easily save 25% or more off of retail and often get free shipping. This is a bundled package which has several benefits over buying individual components. The biggest benefit is overall cost savings. Furthermore, this is a system designed to work right out of the box. The DVR, cameras, wires, and hardware are designed to work together with minimal knowledge and experience required by the customer. The Zmodo PKD-DK4216 Security Surveillance DVR System is a basic entry-level kit. Keeping this mind, the system packs a boatload of features for a relatively low price. The cameras are low-end but work for most situations. If for some reason, a better camera is needed in a certain spot, better cameras can be purchased and installed at any time. Or existing cameras can be used and save the hassle of installing new one. This system is simple, yet flexible enough to help anyone from novice to pro install, setup, and use the Zmodo PKD-DK4216-500GB right out of the box.